"The next chapter in artificial intelligence is here," say the app's creators, Sid Kandan and Carlos Roque. Have you ever wanted a Siri-esque Kanye West app? No, neither have I really, but still – there now is one, regardless of our collective desires. 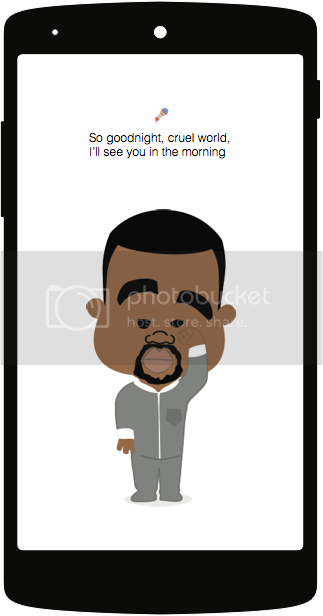 Created by Sid Kandan ("Kanye Futurist") and Carlos Roque ("Left job to draw cartoon Kanyes"), the app – called Ye.i – features a cartoonised, artificially intelligent Yeezy for all your practical conversational needs. There's a trailer for the app, which you'll find below. And below that is a screenshot of the app for your eyes to look at. Ye.i. is the perfect app to inspire your creative genius, and remind you that we are all gods. Fist bump when you want it. Turn up when you need it. Ye drops the mic for you, shares Ye's latest tweets, and is always there with the perfect lyric. You can't control him, but you already knew that. If you must, download it from iTunes, but it is still in the developmental stage. You can also check out the app's site, ye-i.com.